Goodyera pubescens is one of the orchid species whose fungi we are sequencing. Orchid mycorrhizas may be quite different than other types of mycorrhizas. The goal of this project is to understand what genes allow orchid mycorrhizas to function. 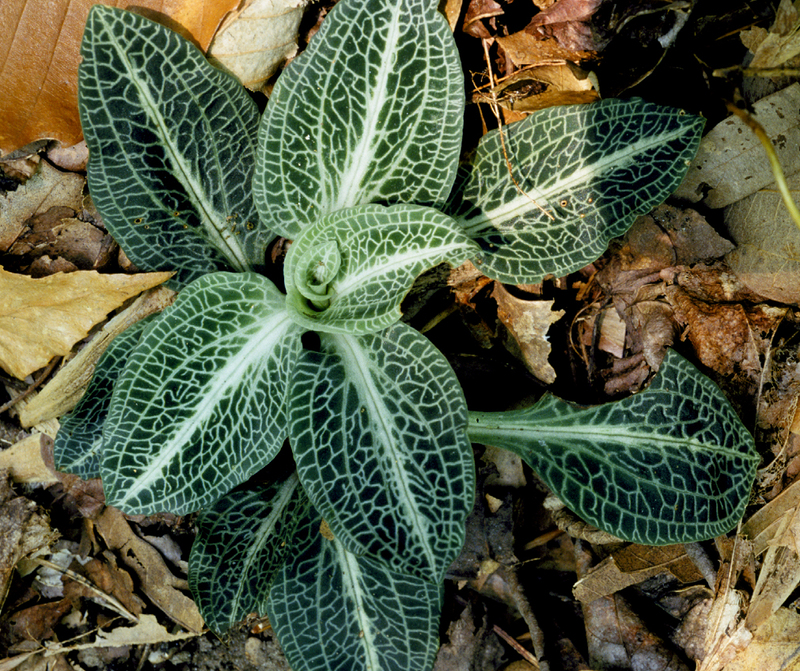 Goodyera pubescens, downy rattlesnake plantain, is a common local orchid that we have studied extensively. Mycorrhizal fungi: Mycorrhizal fungi are a fundamental component of nearly all terrestrial ecosystems, creating the critical link between above- and below-ground systems by establishing an intimate association with the roots of >90% of land plants. This relationship provides plant partners with improved nutrient acquisition from the soil, stress tolerance, and pathogen protection. Most mycorrhizal associations also allow the fungal partners to obtain the photosynthetically fixed carbon sources they need to survive and reproduce. Mycorrhizal fungi impact the function and biodiversity of entire ecosystems, connect unrelated individual plant species, and function as a sink for atmospheric carbon dioxide. Because of the many benefits they provide to plants, mycorrhizal fungi are now widely used in organic agriculture, plant nurseries, and restoration of mine tailings to improve the growth of economically important species. Ectomycorrhizal roots come in many shapes and sizes, depending on what fungi and plants are involved. Distantly related types: The ability to form mycorrhizal associations has evolved multiple times in very distantly-related groups of fungi, potentially resulting in very different mycorrhizal functions. Genomics (sequencing of genomes, identifying genes and their functions) and transcriptomics (determining which genes are expressed in association with different functions) are revolutionizing our understanding of how mycorrhizal associations function. 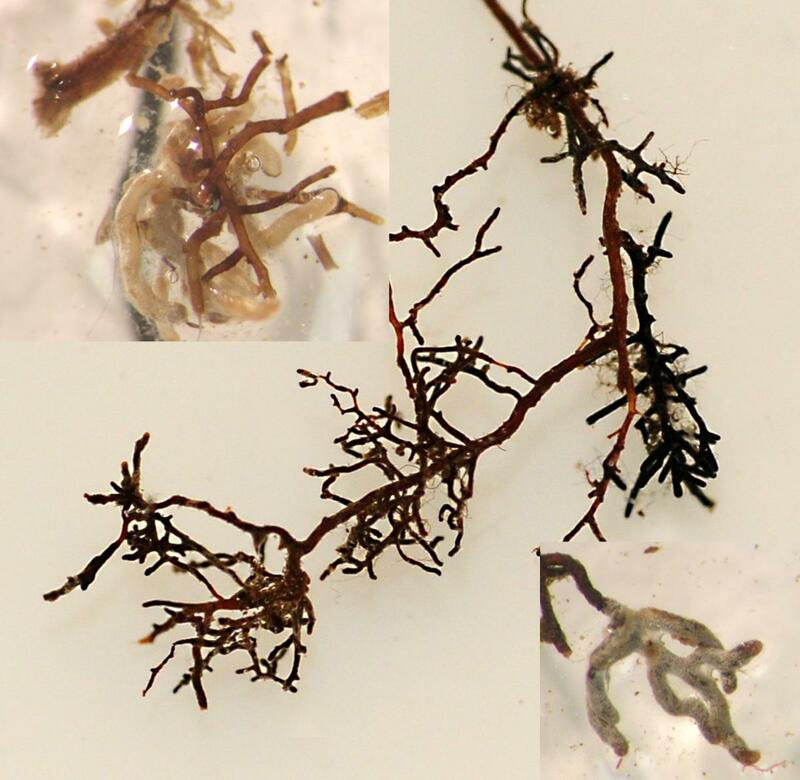 Genomics and transcriptomics have recently been used to identify a proposed ‘mycorrhizal toolkit’ that includes a group of gene functions that have to be included to develop a functional mycorrhizal association. Orchid mycorrhizal associations have long been considered very different from other mycorrhizal associations because the orchids seem to parasitize their mycorrhizal fungi, rather than forming mutualistic association. Orchids rely entirely on their mycorrhizal fungi for all nutrients as well as carbon early in life and this reliance continues to varying degrees later in life. However, all types of mycorrhizal associations range from parasitic towards one partner, through mutually beneficial association, to parasitic towards the other partner depending on habitat or environmental conditions and at least in some cases orchid mycorrhizal fungi may get carbon from their orchid hosts. So, orchid mycorrhizal associations may not be so different and identifying the genes involved in functional orchid mycorrhizas may tell us a lot about how other mycorrhizal associations function. Genomics: We are currently sequencing the genomes of two orchid mycorrhizal fungi, as well as sequencing the transcriptomes of those fungi when they are forming a functional mycorrhizal association and when they are growing by themselves. Most mycorrhizal fungi cannot be cultured without their plant hosts, while most orchid mycorrhizal fungi can, so this is something that is much easier to do with orchid mycorrhizal fungi than with other types of mycorrhizas. This will allow us to determine which genes are involved in functional orchid mycorrhizal associations. We will then compare those genes to the ones identified as part of the “mycorrhizal toolkit” to determine what is similar and what is different about orchid mycorrhizas.